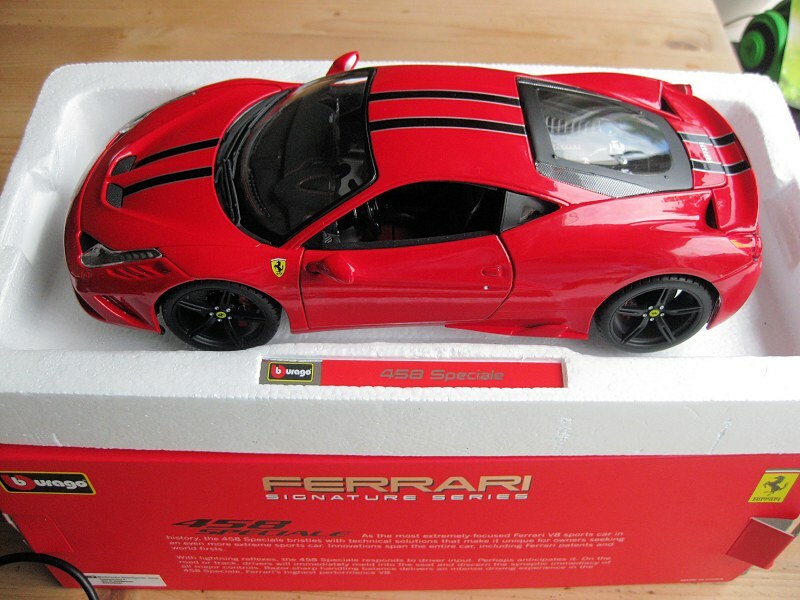 Yesterday I received the much awaited Bburago Signature Ferrari 458 Speciale. 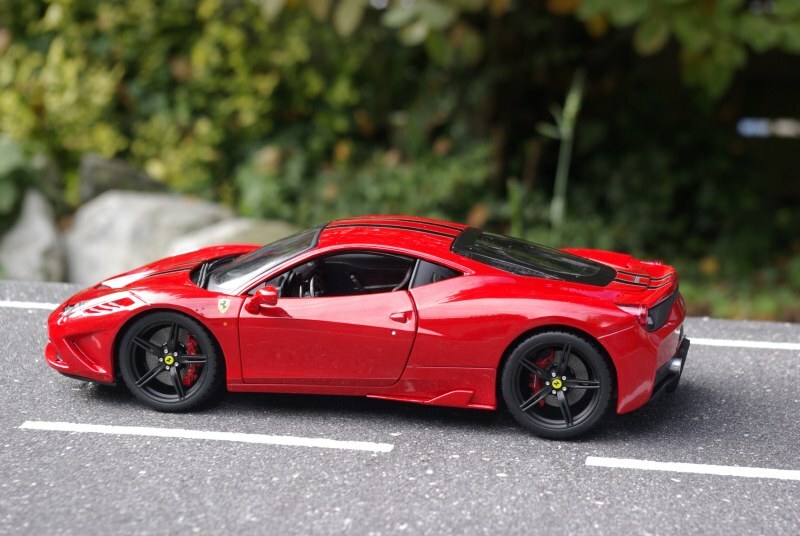 Having owned a Hot Wheels Elite version as well (but sold that on) I can review the Bburago and discuss the differences with the Hot Wheels Elite. I paid 57,50 Euro (roughly $80CND) for the Bburago and about 110 Euro ($154CND) for the Hot Wheels Elite, including shipping charges. The Bburago comes in a flimsy cardboard box. The model is packed in 2 Styrofoam casings and screwed to the bottom one. There are no additional straps. Also no info or a sort of identity card with serial number. The Bburago model has great road presence. The paint is shiny and without orange peel effect, it is a 10 out of 10. The decals are placed precisely and consist of a twin black stripe with silver pinstripes. In combination with the dark red paint and black wheels, it looks the business. The Hot Wheels Elite is a brighter red with white/blue stripe. The decals of many Hot Wheels Elites were poorly placed. Gloss was good, but the paint was thin on several parts, causing the diecast metal to shine through on the edges. The left front wheel is tucked in too much. The other wheels are placed correctly. Ride height seems realistic. 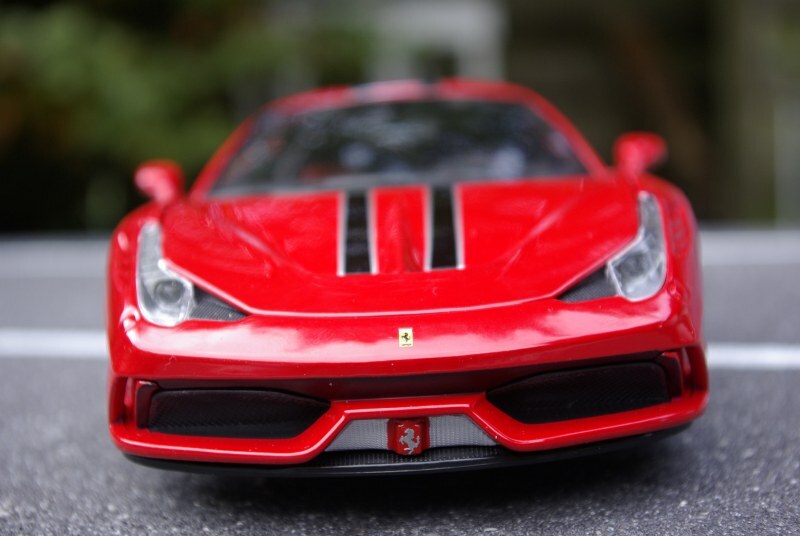 The Hot Wheels Elite has a higher ride height. For anyone who wants to lower the Bburago, it has a full spring suspension. All panels close perfectly and gaps are small. The underside is fully closed. The people who packed the model had their power tool at too high a setting. The screws have damaged the underside, which is spoiled anyway by 2 ugly studs. There is no detailed suspension. 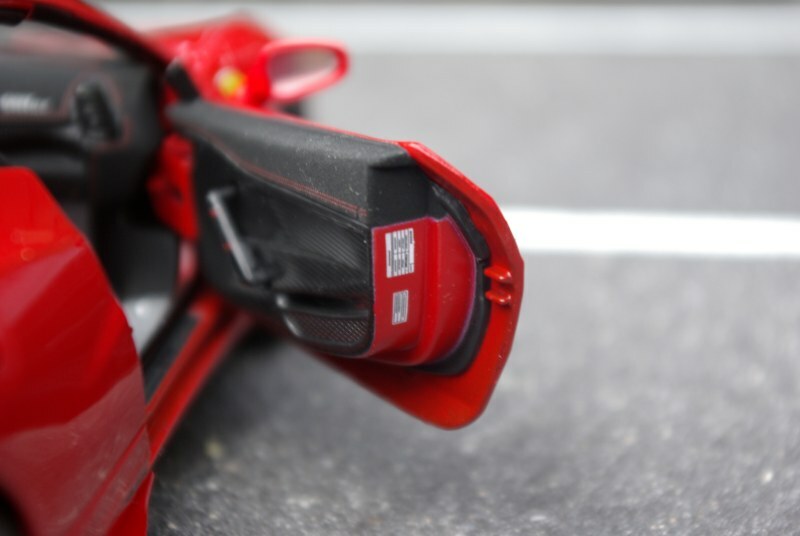 The movable parts of the diffuser are colored bright red. 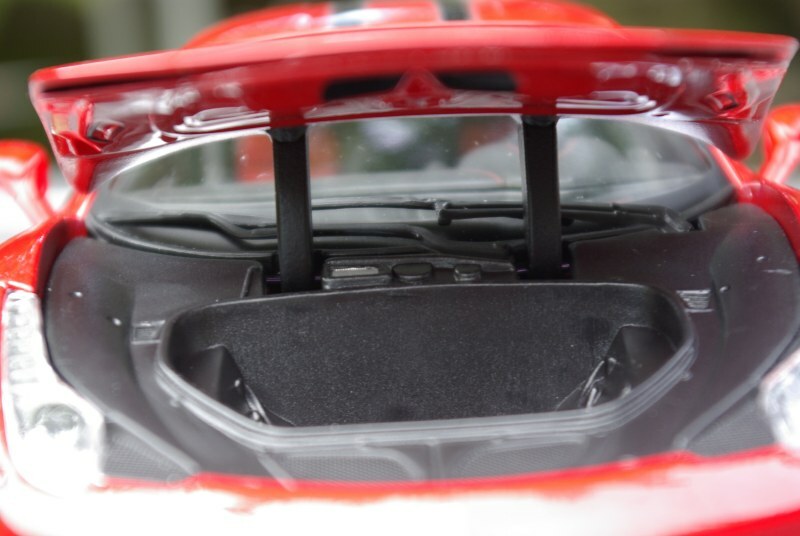 Also the Hot Wheels Elite has the movable parts of the diffuser colored. The Bburago loses points for the front. There is an awkward ridge in the grille. I have not seen that on pictures of real cars. 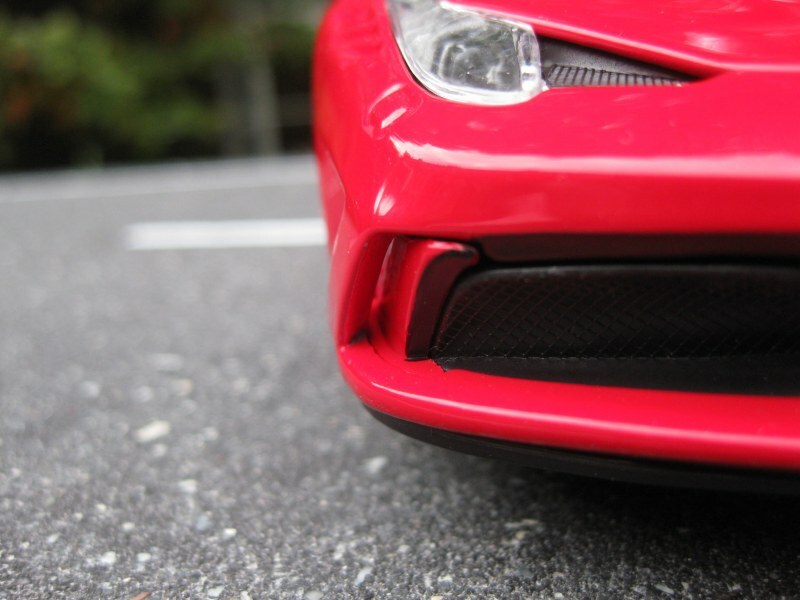 The front lights fascia has the correct dark silver color, but lack sharpness. 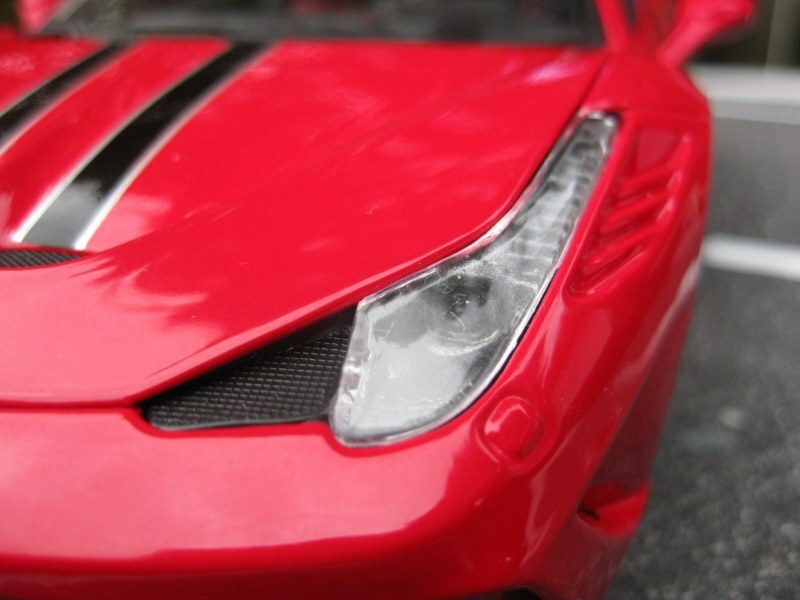 The front lights fascia of the Hot Wheels Elite are too light and on many cars damaged by a hot glue gun. 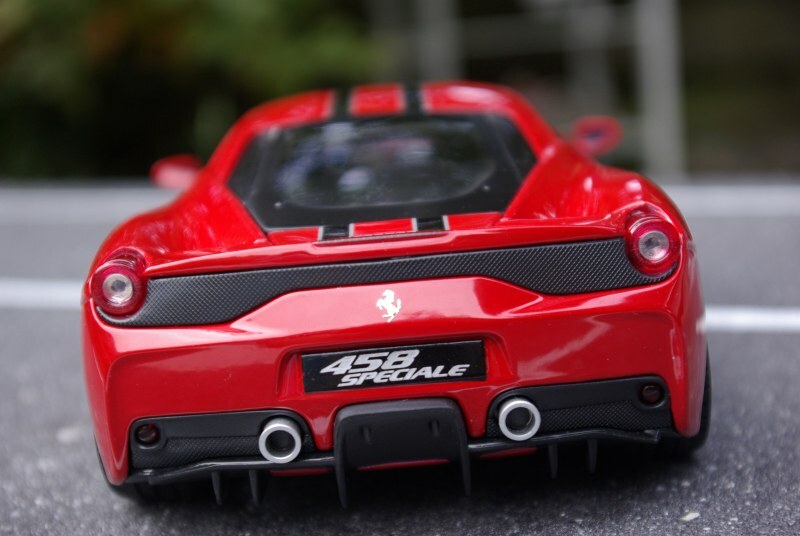 The casting of the fascia and clear plastic on the Hot Wheels Elite is sharper. Logos on both models are photo etched. The Bburago has no photoetched mesh, it’s all plastic imitation. The Bburago has side chin vanes that are actually open. From the front it looks great. But from the back it doesn’t look great. The missing chunk disturbs the line of the nose. Pity. 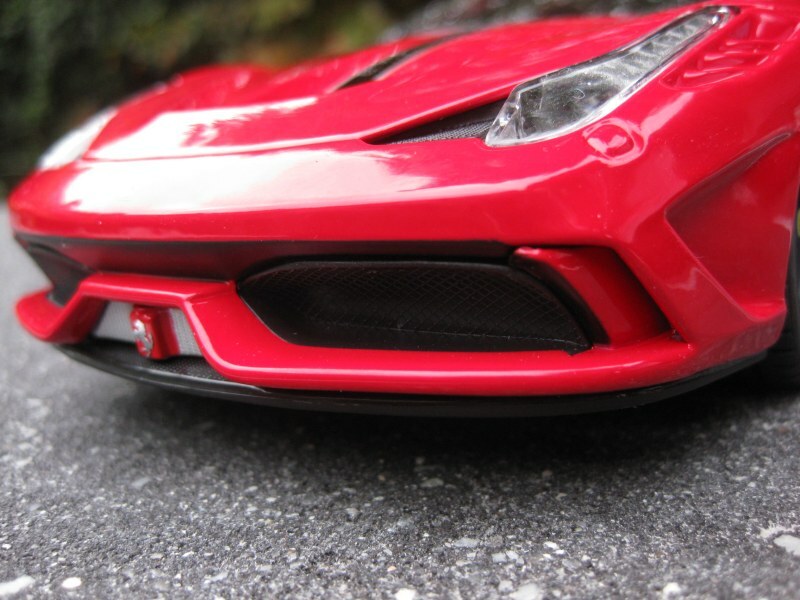 Therefore I prefer the closed chin vanes on the Hot Wheels Elite. The Bburago loses points again. 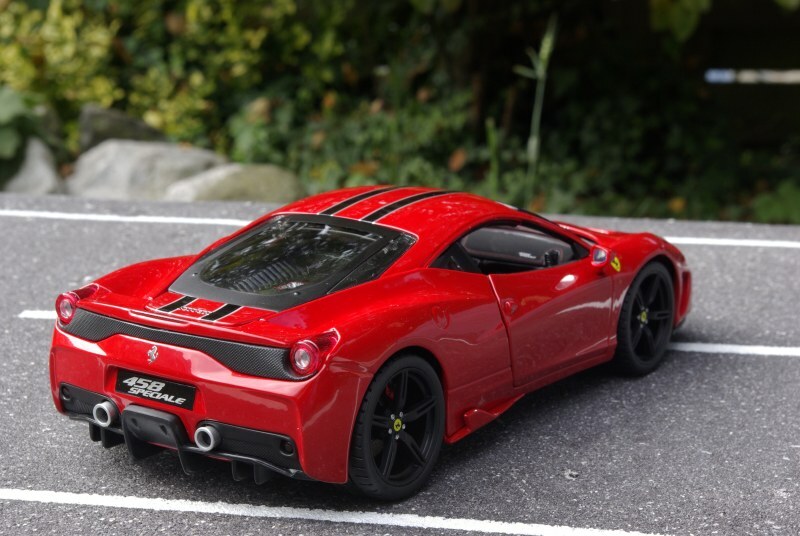 Both models lack photo etched mesh, but the Hot Wheels Elite has better detailed tail lights, fog lights, and the tail pipes are sharper looking. 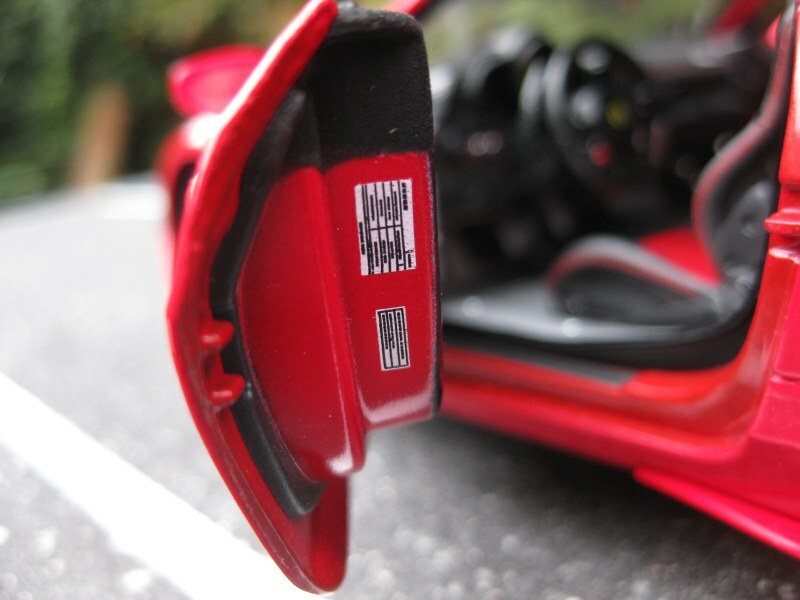 The Hot Wheels Elite has a separate clear part for the 3rd brake light, while on the Bburago it is a black dotted sticker. One of the worst features on the model. 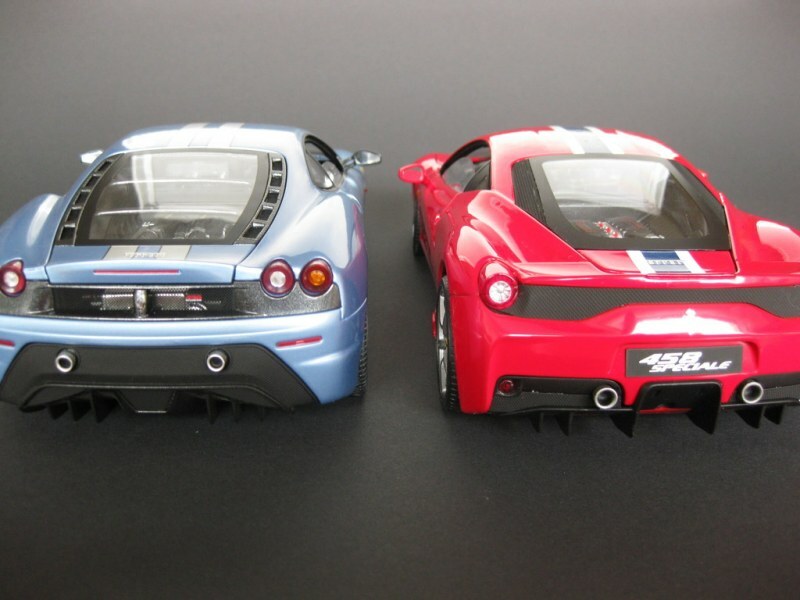 For comparison the back end of the Hot Wheels Elite (together with the 430 Scud, which is far superior in detail to the Hot Wheels Elite 458 Speciale, they cut some corners here to be able to get the models out before the end of the contract). Bburago has taken huge steps with the wheels, brakes and tyres. 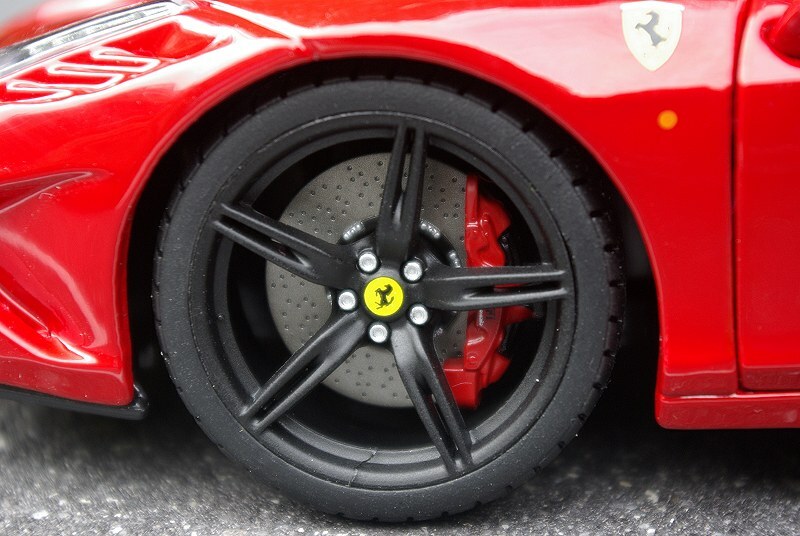 There are some flash lines visible on the wheels, but the casting is fine, the brake discs have the correct color, the calipers are sharp and properly decaled. Thumbs up for the Bburago, the Hot Wheels Elite comes close but just misses out on details and sharpness. 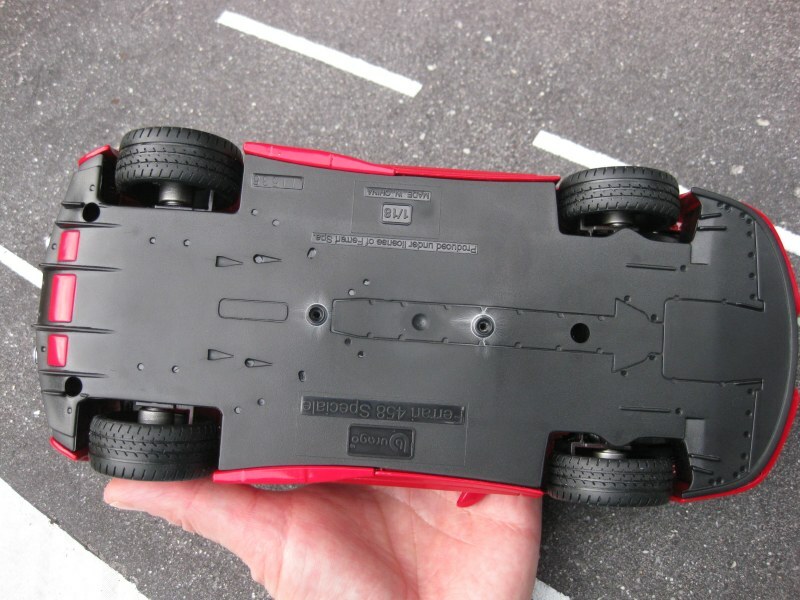 Tyres are unmarked on both cars, and the Bburago ones have a bit too much tread. A modder will no doubt sand these down. Both models have uninspiring trunks, but the Bburago kills it with huge doglegs. On the signature they are painted black luckily, but you never want to open it. 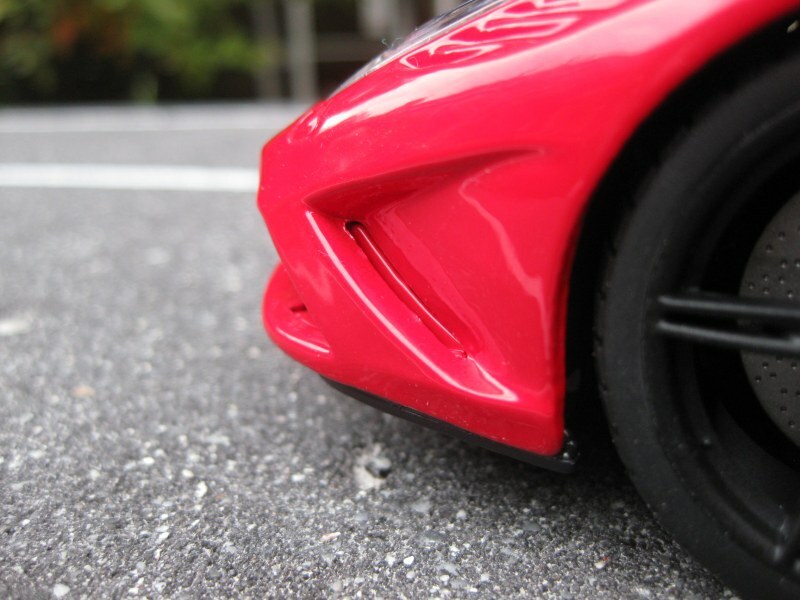 How hard can it be to put small doglegs at the sides as Hot Wheels Elite had done? 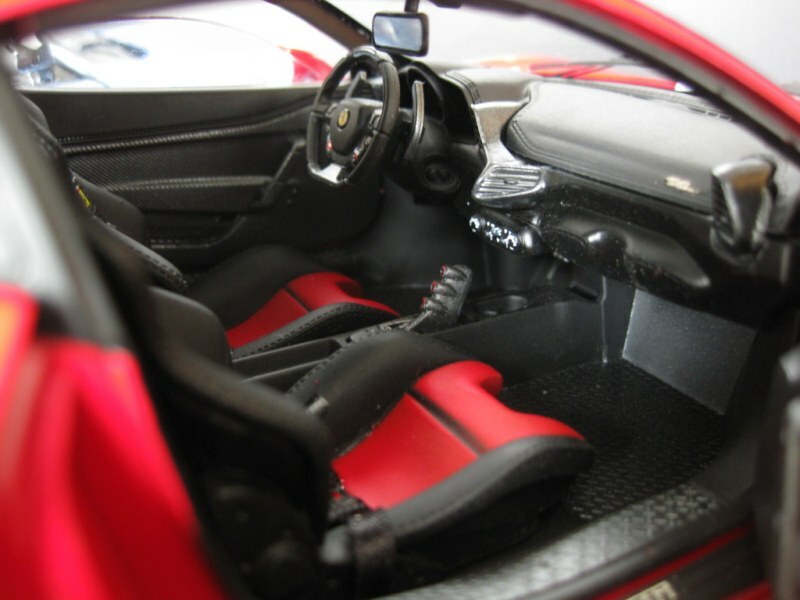 Bburago has made giant leaps with the interior of the car. 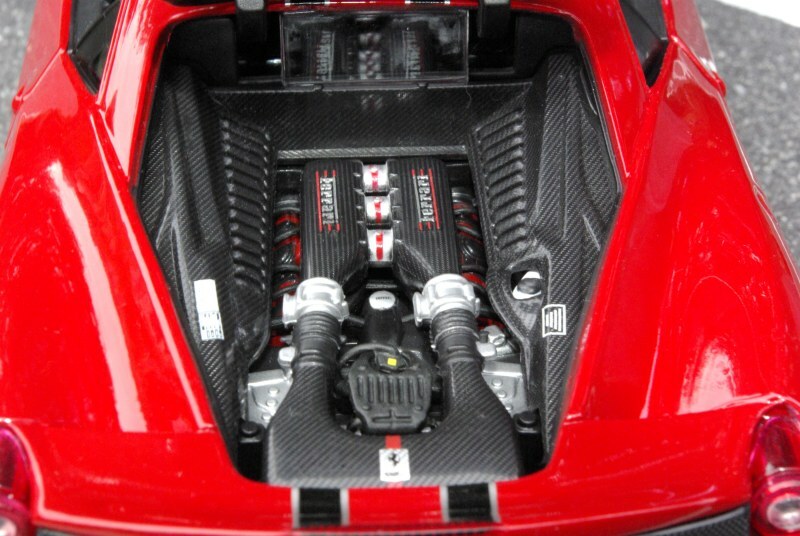 I am in shock and awe, it’s AUTOart quality. 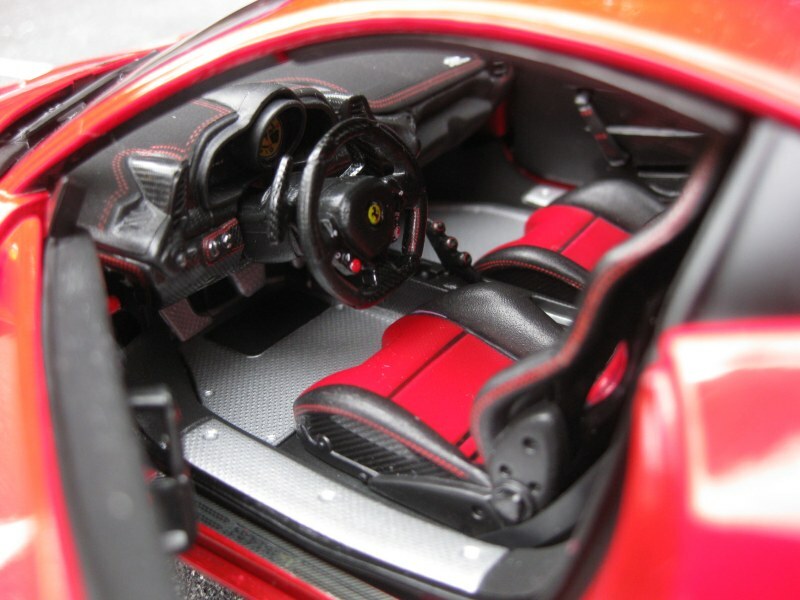 Stitching and flocking on the door cards and dashboard, decals, and a proper metal floor, amazing. Just too bad Bburago installed a normal black safety belt. 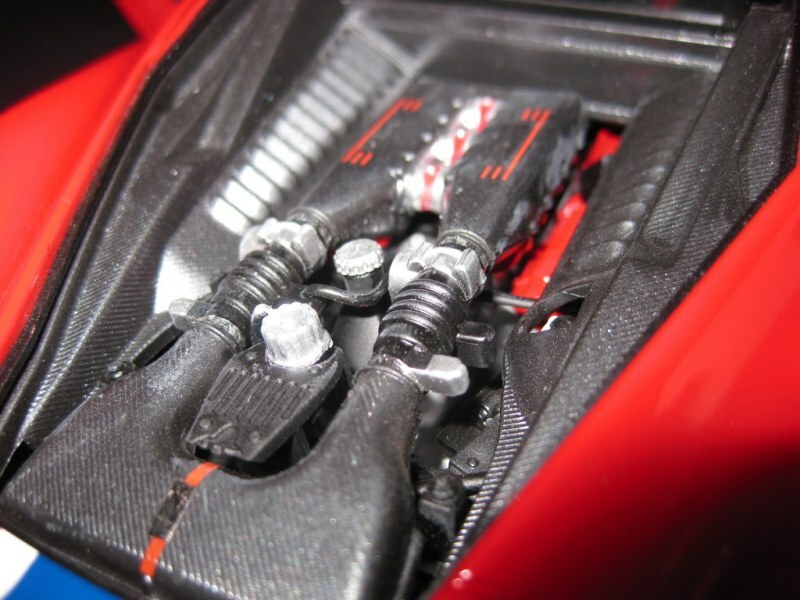 Hot Wheels Elite has a nice looking safety harness, only spoiled by glue stains. The Bburago seats have a bit too much gloss, they should be Matt since it is fabric. Hot Wheels Elite is slightly better with the matting of the seats but loses big time with sloppy detailing and poor paintwork. I believe these stickers should be horizontal. Obviously, and much criticized, is the lack of windows. I would like to add to that the fact that the doors have very heavy and brightly colored -thus visible- springs. They are heavy to open, have a limited opening angle and the hinges are obtrusive. 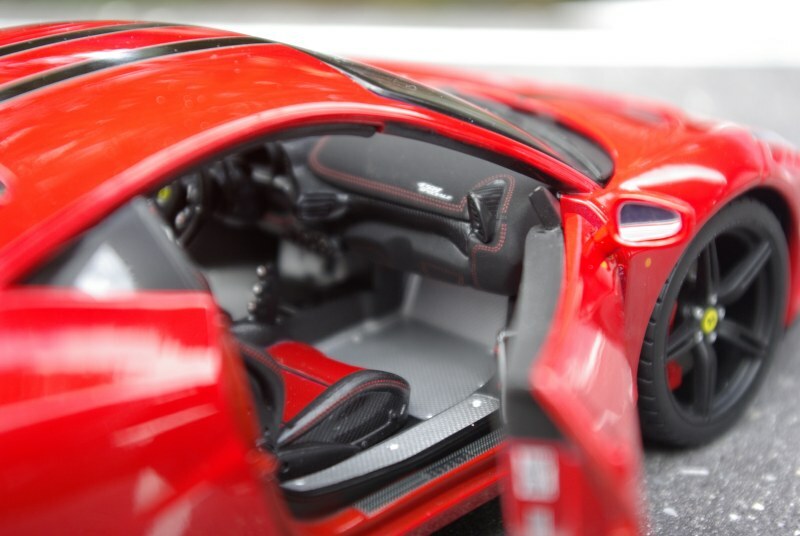 In contrast, the Hot Wheels Elite has proper and easily opening doors with invisible hinges, but the interior is no match for Bburago. Another leap by Bburago and a victory over Hot Wheels Elite. 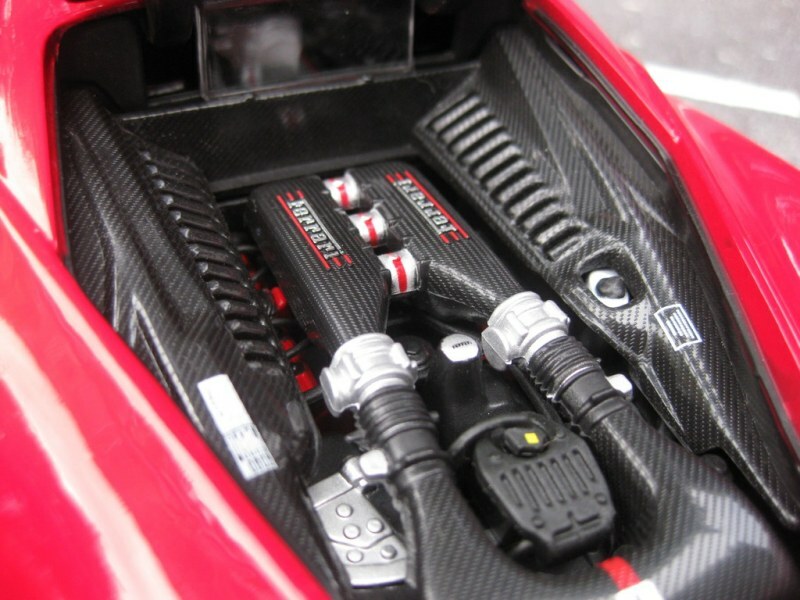 Better detailed, tiny decals, good looking carbon fibre and multiple layers with visible cam covers and plug leads. Wow, so beautiful. Just one problem, the hatch is very difficult to open, I used a pin to pry between the gap. It needed quite a bit of force on my model. 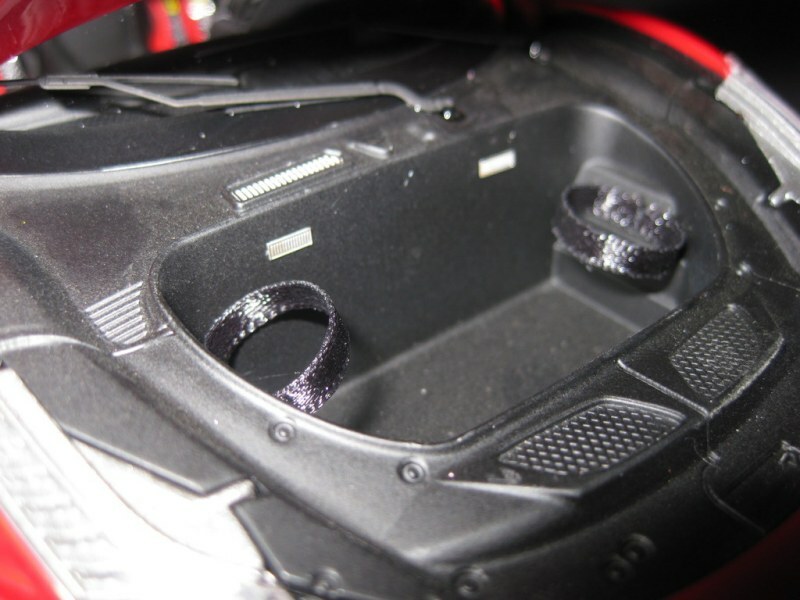 Both models have doglegs, but the Hot Wheels Elite has them in the corner so they are less noticeable. Bburago should fix this with their future models because it’s plain stupid. Also, no mesh on the Bburago. 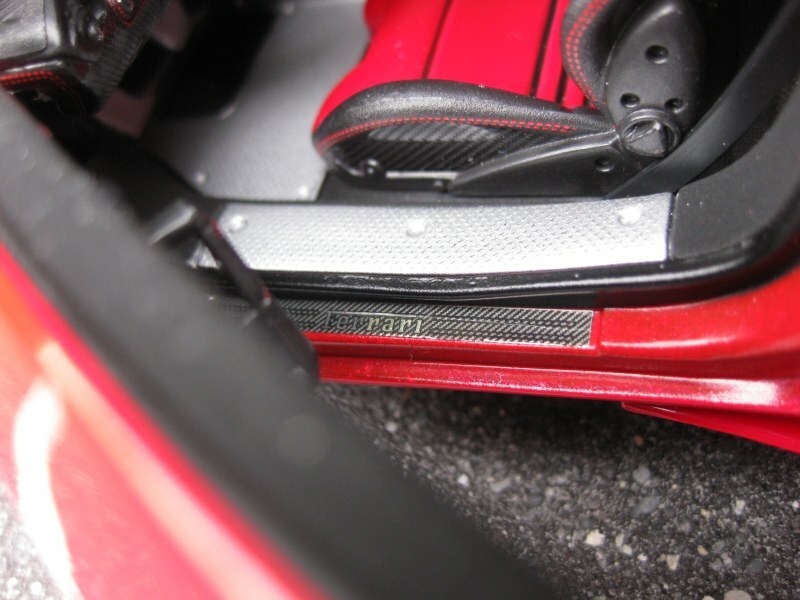 The Hot Wheels Elite has mesh beside the hatch window, but poorly glued. 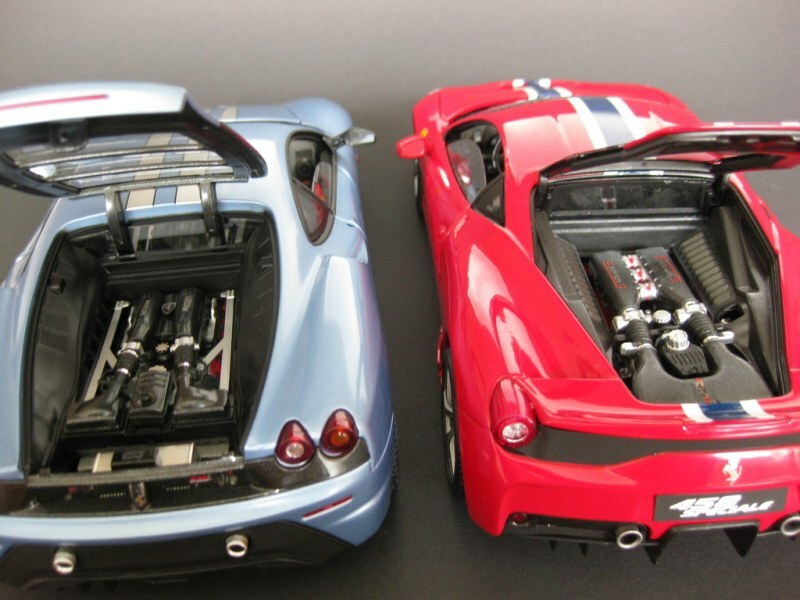 In contrast, the 430 Scud is perfect. There is no QC sticker on the Bburago. Issues on my car are the damaged underside, the left front wheel too tucked in and a skewed exhaust tip. The latter was easy rectified. It seems they are not glued but just popped on. 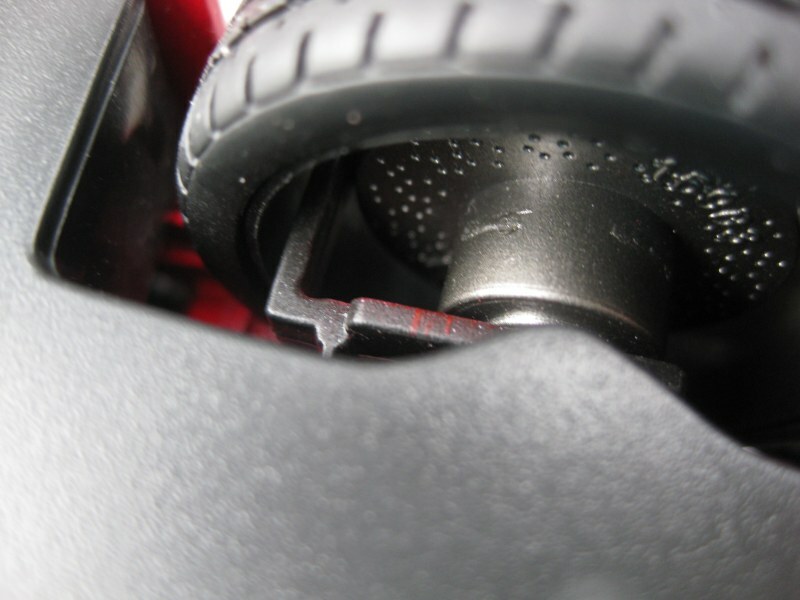 My Hot Wheels Elite had terrible QC issues. Glue everywhere, badly glued side repeaters, decals poorly placed, fingerprints in the paint and so on. All due to the rush to get the models out of the factory before the end date of the contract, but I felt quite insulted as a buyer. I sold it and bought myself this Bburago Signature. 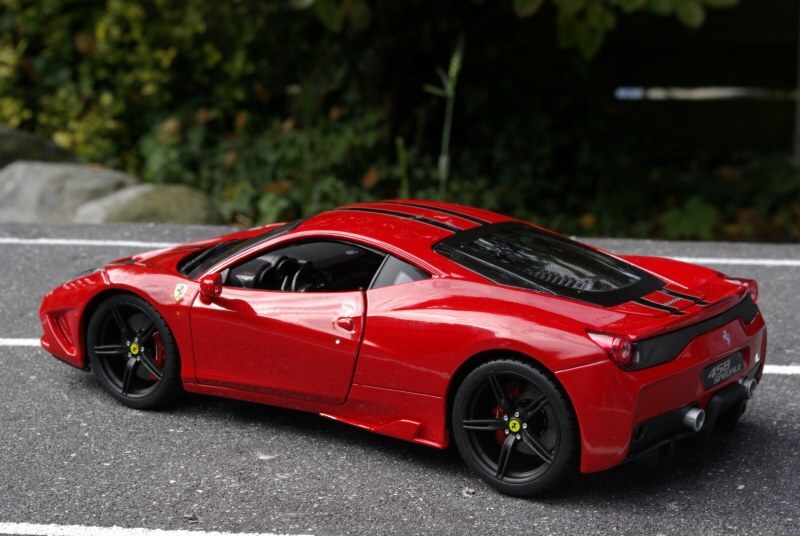 If the Hot Wheels Elite did not have serious QC issues and was in the 80 euro price bracket, it would have been the preferred choice despite losing points on the interior, engine and wheels/brakes. Bburago has delivered a strong contender with beautiful paintwork, decals, engine, interior and wheels/brakes. The open side chin vanes are a bold design feature but the resulting missing chunk disturbs the line of the nose. Also, the terrible dog legs and inferior tail and headlights spoil a bit of the fun. I would call it almost even, but the Bburago has a very competitive price of less than 60 euros and takes the win. End verdict is a 7/10. It is a bright start for even better models to appear. Please Bburago get better lights and fix the hinges issue. 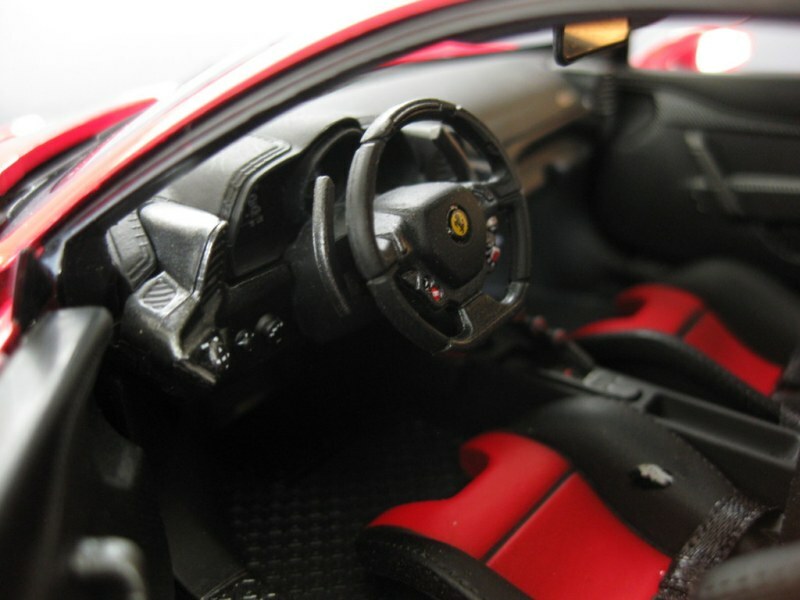 7 Responses to "REVIEW: Bburago ‘Signature’ Ferrari 458 Speciale (w/Video)"
I’m somewhat impressed! If Bburago is serious in winning the hearts of collectors they need to read and learn from the feedback here and abroad. 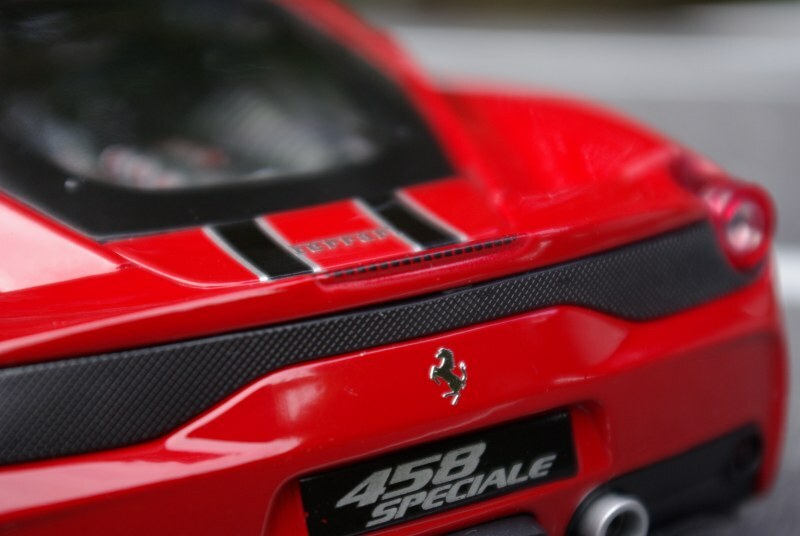 I hope they can get their models to the level of Hot Wheels Elite pieces prior to the LaFerrari and 458 Speciale. I’m looking (positively) looking forward to more cars, hopefully they will expand the Signature series beyond Ferraris! Excellent review but for 50 dollars you should not be disappointed about anything. You are not going to get a perfect model at that price point, to lose the doglegs, improve the lenses, fix the front end and add real mesh would significantly raise the price. The only disappointment one should have with this model is that BBuargo could have corrected all those issues and made the model as good as the HWE and perhaps for less money. 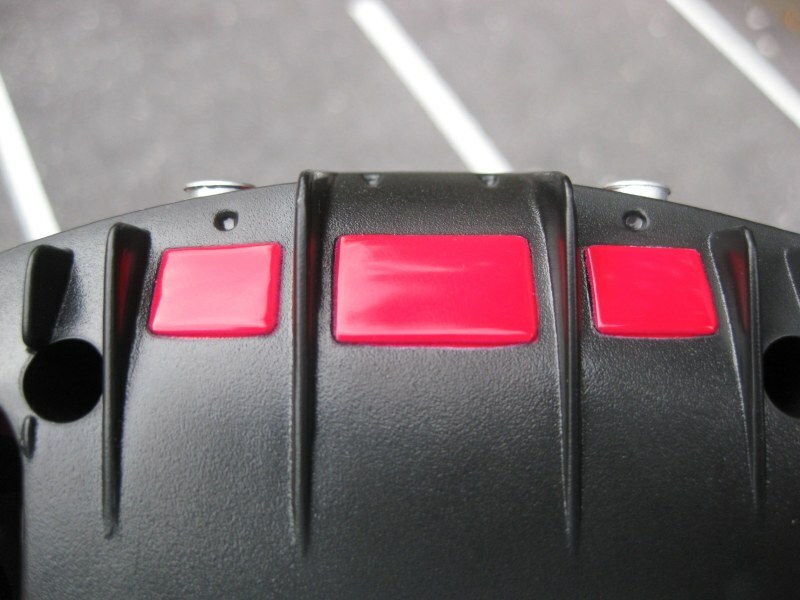 I agree cost would be added with the addition of real clear parts for the third brakelight and side repeaters. I would pay extra for a “super signature” model with improved lights, mesh and proper hinges. But for this signature model the taillights could be much better without costing a dime. Now the inside of the clear part is smooth. But if the inside of the clear part would have indents and ridges as on the HWE (not that difficult considering the lights come out a 2 part mould), it would give the light a sort of sparkle that’s missing now. 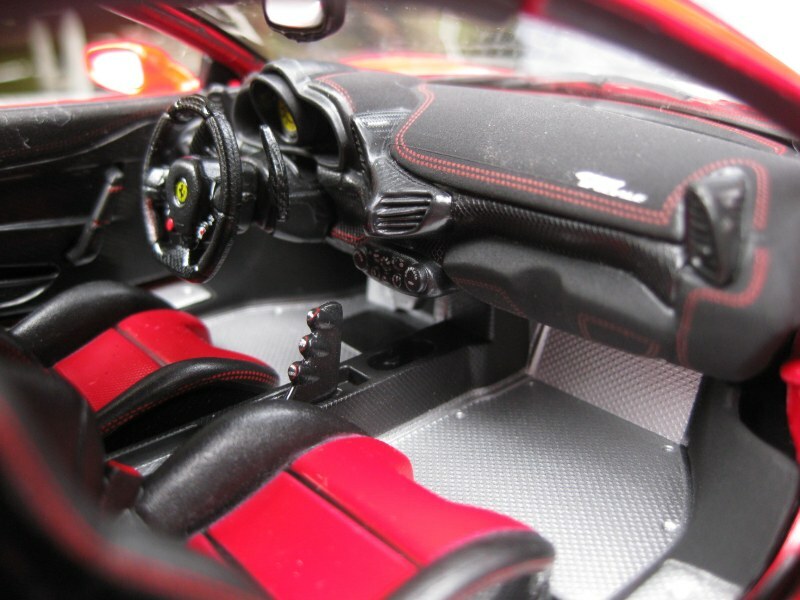 I think Bburago has made a huge progress.If they can add the window ,and have more accurate model with highly detailed parts,they will win!This model is not saled in China,the China company’s client told me they are not satisfied with the shape and the quality of the Laferrari in black,so they don’t dare to produce them for Chinese market. 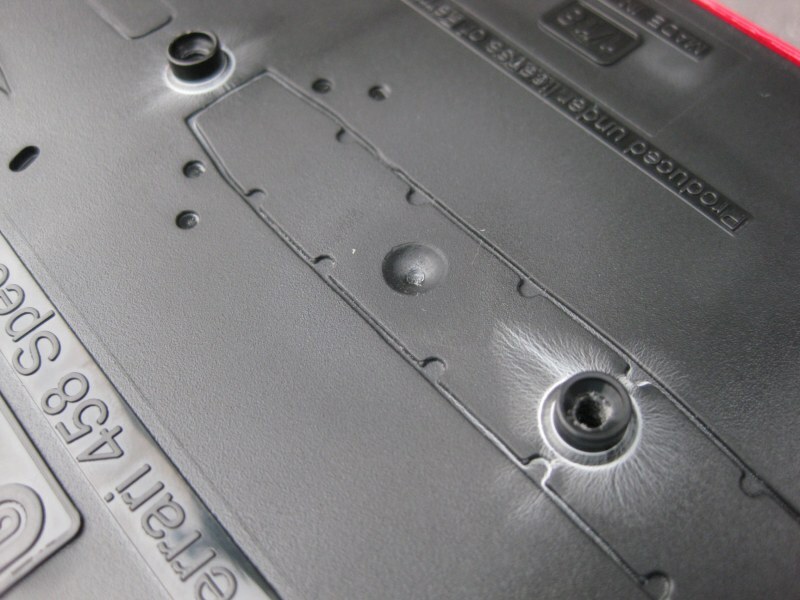 Bburago is a starter brand with no good details its for children if you need detail you must have an AUTOart of that sort of brand, BBR, Norev, this is not good detail from Bburago. Incredible at first appearence. When i saw it, i felt very interesting about it, and i bought it. For me it´s really fine and i would like to buing a Lambohrginy Aventador 2017.